The criticism against Heathrow, the UK’s busiest airport, shows no signs of abating. Everyone from weary travellers, fed up with interminable queues, overcrowding and delays, to environmentalists campaigning against the building of a third runway, seem to have it in for the airport and its owner, BAA, which was bought by Spanish company Ferrovial for £10.3bn last year. Political leaders and human rights lawyers have joined in the attacks after BAA moved to ban environmental protesters planning to pitch tents for a week near the airport to demonstrate against the third runway. As BAA prepares to battle in the High Court today for an injunction against the protesters, the company provides an update on progress at Terminal 5. The state-of-the-art terminal, scheduled to open next March after lengthy delays due to planning wrangles, should go some way to make the Heathrow experience a more enjoyable one for passengers than at present and allay some of the concerns for business travellers. Nick Ziebland, the retail strategy director of BAA and retail director at Terminal 5, concedes that the biggest problem for those passing through Heathrow’s existing terminals has been overcrowding. The airport was designed for an annual capacity of 45 million but exceeds this by half as many again as 68 million passengers fly through each year. During the summer holiday season, the airport’s busiest time, up to 220,000 people a day pass through the airport, testing the terminals to the limit. Heathrow’s recently departed chief executive Tony Douglas admitted that the airport was “in some places held together with sticking plaster”. Terminal 5 is expected to reach its capacity after a couple of months, he said. Its annual traveller capacity will be 30 million. British Airways will transfer to the new terminal, with almost all BA flights leaving from T5. Terminal 2 will also be demolished at a later date to make way for Heathrow East, which is scheduled to open in 2012. The other terminals will also undergo a revamp. The main T5 is certainly an impressive building. Designed by Richard Rogers Architects, it is a magnificent steel structure and offers spectacular views over London. Those travelling by car can drive straight off the M25 to the terminal and, on a clear day, will be able to see Wembley Stadium, Windsor Castle and all the way through to the Gherkin in the heart of the City. Mr Ziebland certainly has his work cut out. 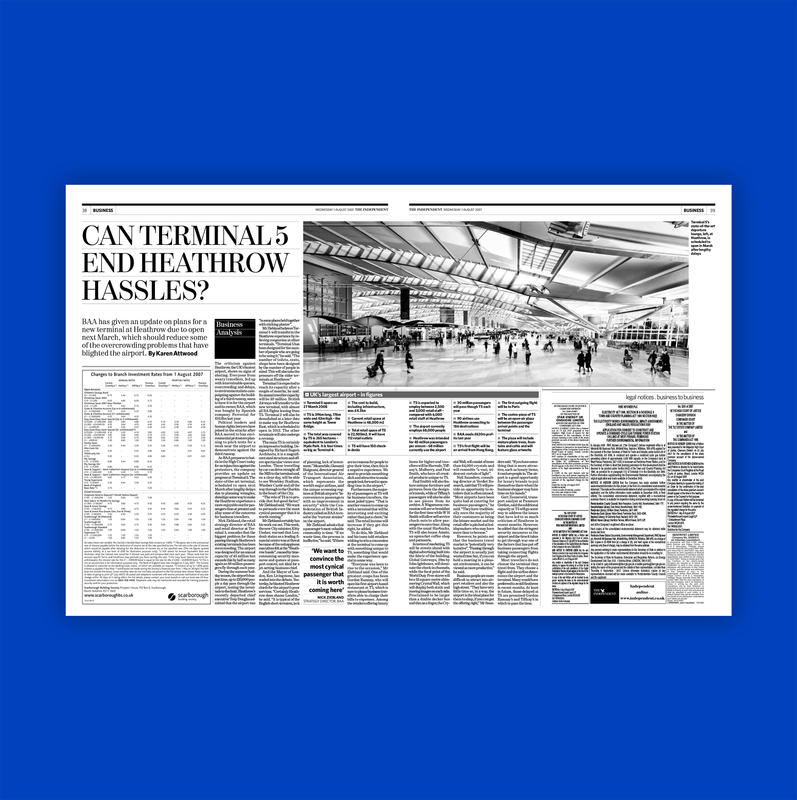 This week, the new City minister, Kitty Ussher, warned that London’s status as a leading financial centre was at threat because of the unhappiness executives felt at the “Heathrow hassle”, caused by time-consuming security measures and queues at passport control, not ideal for a jet-setting business chief. And the Mayor of London, Ken Livingstone, has waded into the debate. Yesterday, he blasted Heathrow chiefs for the airport’s poor services. “Certainly Heathrow does shame London,” he said. “It is typical of the English short-termism, lack of planning, lack of investment.” Meanwhile, Giovanni Bisignani, director general of the International Air Transport Association, which represents the world’s major airlines, said the unique screening regimes at British airports “inconvenience passengers with no improvement in security” while the Confederation of British Industry called on BAA to resolve the “current strains” on the airport. Furthermore, the majority of passengers at T5 will be business travellers, the most jaded types. “That is another reason to come up with a terminal that will be interesting and exciting rather than just a chore,” he said. The retail income will increase if they get this right, he added. To do this, Mr Ziebland and his team told retailers wishing to win a concession at the terminal to come up with something unique to T5, something that would make the experience special in some way. “Everyone was keen to rise to the occasion,” Mr Ziebland said. One of the greatest coups has been Gordon Ramsay, who will open his first airport-based restaurant at T5, which is sure to please business travellers able to charge their bills to expenses. Among the retailers offering luxury items for higher-end travellers will be Harrods, Tiffany’s, Mulberry, and Paul Smith, who have all created products unique to T5. Paul Smith’s will also feature antique furniture and pictures from the designer’s travels, while at Tiffany’s passengers will also be able to see pieces from its archive. A Wagamama concession will serve breakfast for the first time while W H Smith will allow self-service check-outs to allow passengers to save time. Along with the usual Starbucks, T5 will also house Amato, an upmarket coffee shop and patisserie. In terms of marketing, T5 will be streets ahead with digital advertising built into the fabric of the building. Global Gateways, 29m by 3.6m lightboxes, will dominate the check-in channels, while the focal point of the World Duty Free stores will be a 52 square-metre shimmering Crystal Wall, which will display both static and moving images on each side. Proclaimed to be larger than a double decker bus and thin as a finger, the Crystal Wall, will consist of more than 64,000 crystals and will resemble “a vast, iridescent curtain of light”. However, he points out that the business travel market is “potentially very lucrative”. “Passing through the airport is usually just wasted time but, if you can hold a meeting in a pleasant environment, it can be viewed as more productive,” he said. Gert Zonneveld, transport analyst at Panmure Gordon, said the additional capacity at T5 will go some way to address the issues that have led to so much criticism of Heathrow in recent months. However, he added that the stringent security measures at the airport and the time it takes to get through was one of the factors that has put off business passengers from taking connecting flights through the airport. Most travellers do not choose the terminal they travel from. They choose a flight and the airline determines the airport and the terminal. Many would have preferred to avoid Heathrow in recent months. At least in future, those delayed at T5 are promised Gordon Ramsay’s and Tiffany’s in which to pass the time. T5 is 396m long, 176m wide and 43m high – the same height as Tower Bridge. The total area covered by T5 is 265 hectares – equivalent toLondon’s Hyde Park. It is four times as big as Terminal 4. T5’s first flight will be an arrival from Hong Kong.